We didn’t even end up exploring the town centre of Vasto. Not because we weren’t interested, or that there was nothing on offer. But the little holiday bungalow we found, at just 60euro a night, and 10 steps down to the beach, was the magic do-nothing break we needed. “Residence Uliveto” is run by the most lovely family, who are relaxed, generous, and happy to come over for a chat about our travels and about being the first ever Australians to stay with them. In 25 years! Their brochure says it all “We believe in the unity of places, people and emotions. We believe in bags filled with memories. We believe in the possibility of taking things slowly. We believe in the beauty of simple things…we believe that sharing is the only way to happiness”. Not only did Alfonso and his mother Adriana share their gorgeous little beach with us, but they cooked us the best meal we’ve ever had. 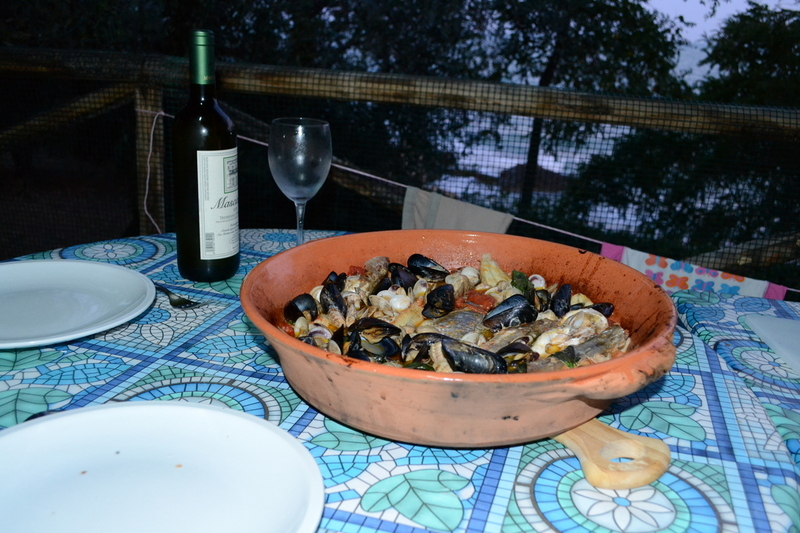 Brodetto vastese – a fish and seafood soup made only in Vasto. The keys are small, fresh seafood. A terracotta pot. And fresh olive oil (theirs was from the olives grown on the property) tomatoes and capsicums. We ate up every last bit, and soaked up the juices with crusty bread. They also brought us a bottle of perfectly paired Abruzzese white wine. We ate it on our little plastic table, with the moon shining through the trees and the waves crashing on the rocks below us. The next day as we were leaving, we asked Alfonso what we owed them for dinner. “Nothing. It is our gift to you for being our first Australian guests”. Seriously?! Could these guys be ANY more amazing, sweet or generous? Most delicious, and memorable, meal of my life. Previous Post Go with the Flo. Next Post Trulli, Madly, Deeply. Wonderful, since we’re much closer than the Austrailians, let’s see if we go and discover this marevelous place! The cabins are quite simple Mary Anne, but we spent most of our time outside anyway. Enjoy!